The supermarkets have gone into a frenzy recently and started doing their own versions of low calorie high protein ice creams, with Aldi now doing a version, Morrisons, Asda and even Lidl! 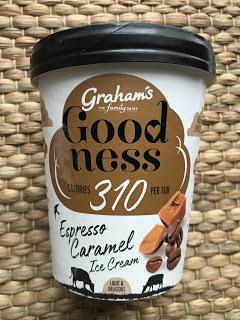 They've just started selling a 4 variety range from Graham's Family Dairy, which is lower in sugar and higher in protein than most regular ice creams. I was lucky enough to be sent the range to sample from Graham's - thanks so much guys! These are available from Lidl stores now for just £2 a tub. 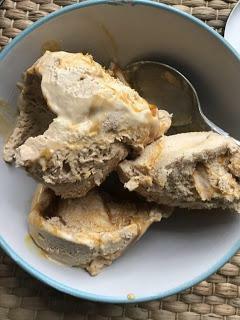 There's White Chocolate and Rasperry, Salted Caramel, Mint Choc Chip and this Espresso Caramel Ice Cream in the range. 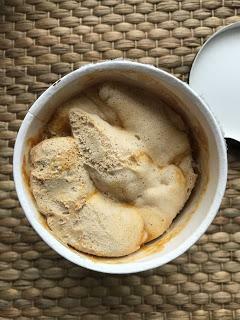 I'm starting with this because it was my absolute favourite and is a pretty unique ice cream too. The whole tub contains 310 Calories and 21g Protein. Now I don't know how this compares to the calorie and protein contents of other ice creams (I'm not one of those who care - ice cream is ice cream as far as I'm concerned and it's always a treat!) but I'm assuming it's better since they're advertising it. There's some ingredients such as polydextrose which is a type of fibre as well as the sweetener sucralose, to lower the sugar and up the fibre content. But the most important thing of course is the taste! And it tastes delicious! Opening the tub the ice cream looks quite "light" and I was worried at first it might be one of those weak tasting ice creams, but thankfully that wasn't the case. The flavour is lovely - the ice cream is luxurious and creamy, whilst also somehow being on the lighter end compared to say, a tub of Haagen Dazs. 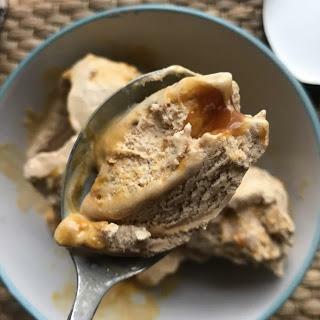 The espresso sauce and caramel flavour sauce mingle together to create a lovely sweet, buttery coffee flavour that works perfectly. I really enjoyed this, and I'm not always one for coffee flavoured ice creams as I feel they often miss the mark somehow. The coffee here is strong enough to notice but doesn't overpower the caramel either. I didn't really view this as a healthy ice cream or anything as it tasted so creamy,...but I guess it's good to know that it is. Overall then, if you're a fan of lighter, higher protein ice creams these are a must try! Get yourself to Lidl pronto, you won't be sorry. I'm curious how these compare to all the other new protein ice creams being launched recently...if you've tried these, Asda's, Aldi's, Morrisons or Halo Top's versions please do let me know your thoughts! Nutrition (per 100g): 69 Calories, 2g Fat, 8.6g Carbohydrates, 7.1g Sugars, 4.6g Protein, 3g Fibre.